We install Laminated Flooring with the greatest care and the best craftsmanship in town. We pride ourselves in giving all our clients the best quality finishes possible. How many times have you seen homes with poor skirting work by the door frames? I’m sure your answer is “MANY TIMES”. Well, this is where it ends. We are proud to say that with us you will no longer experience things like this. Let me explain. Steel frames with carpets and tiles, the skirting usually stops against the frame. The big problem in the laminated flooring industry is that most installers leave the skirting like this and then fills up the gap between laminated floor and door frame with matching acrylic sealant. The problem we have with this is that it doesn’t look finished and that the acrylic sealant gets dirty very quickly. As you can see in the pictures above, this is not the way that we do it. We will cut all the little pieces you need to go all around the frame, leaving a beautiful finish without any filling. After more than 7 years we are still the only flooring company that gives detail like this to wooden floors. With wooden frames we will cut the thickness of the wooden floor out from underneath the frame and slide the floor in underneath the frame. 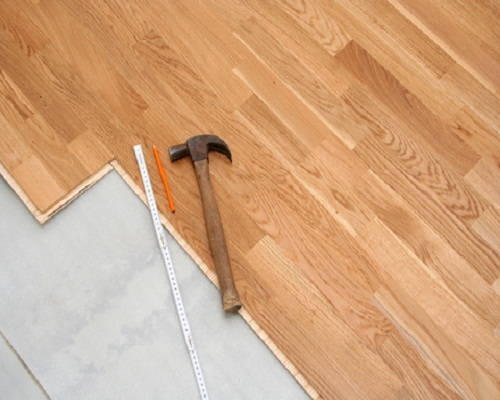 Preparation of your sub floor "see Floor Preparation" for a wooden floor is very important. If you slip up here you will learn a very expensive lesson. It is very important that all surfaces are dried to about 3% moisture content. All walls must also be free of rising damp. The sub floor must also be completely level. Over a distance of 3 meters a rise or dip in the floor must not exceed 3mm. There may be no sudden or small dips and rises. Un-level sub floors cause for problematic installations and if ignored, it could damage your warranty. If you play by the rules, you will have one of the most beautiful floors around for many years to come.